There are no spots on the sun today. 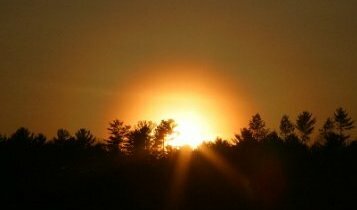 Solar activity should remain low. Credit: SOHO/MDI. AURORA WATCH: A solar wind stream flowing from a coronal hole on the sun is expected to hit Earth today. This could cause a geomagnetic storm and auroras over Alaska and Canada. See the gap at the bottom of the flame? Our entire planet could fit through it with room to spare. No wonder prominences are so easy to see; they're huge. "Newton's flame" is still flickering today. If you have a solar telescope, take a look. 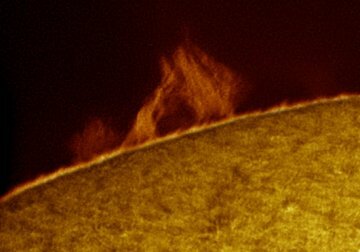 Note: Prominences may look like flames, but they are not fire. The flame-like shapes are formed by magnetic force fields holding clouds of hydrogen above the limb of the sun. Combustion has nothing to do with it. POLLEN CORONAS: It begins with a sneeze. Pollen floating through the air tickles your nose, and your body responds by expelling the allergen. Gesundheit! Specks of pollen are very small, and when they float through the air they diffract sunlight, forming the softly-colored rings of light in Haggadone's photo. Tiny crystals of ice or droplets of water in the air can do the same thing--but unlike pollen they do not cause sternutation. You are visitor number 33938654 since January 2000.